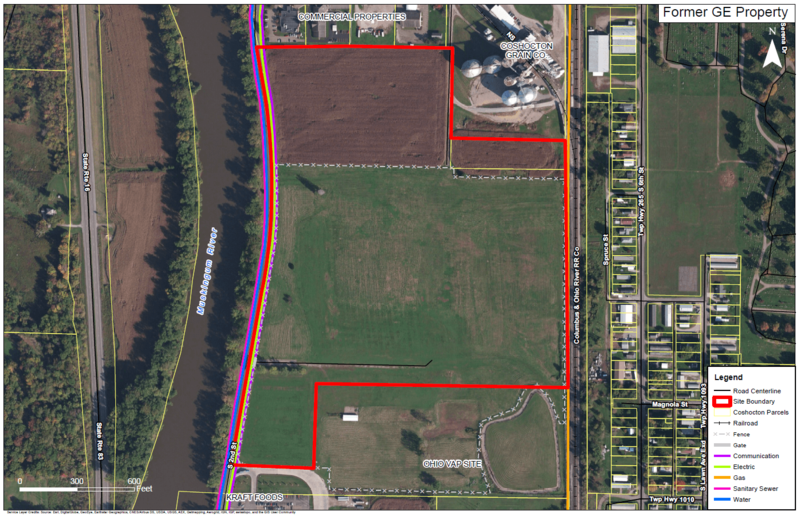 The Former GE Property is 57.48-acres of flat vacant land and is available for industrial use. Rail is adjacent to the property, and an abundant water supply and wastewater capacity is available. Phase II has been completed, and all utilities are present. The site is ideal for food processing, fermentation, dairy, and other large water users. 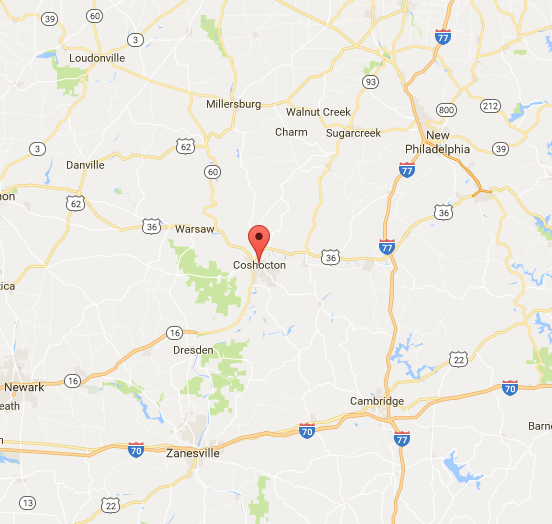 Coshocton is conveniently located between Pittsburgh, PA and Columbus, OH. 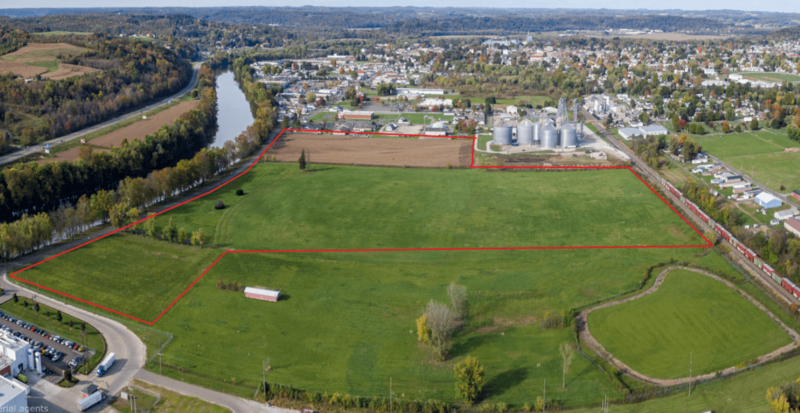 This site is under recommendation for two local incentives from the Coshocton Port Authority as well as consideration for reduced water and sewer rates. 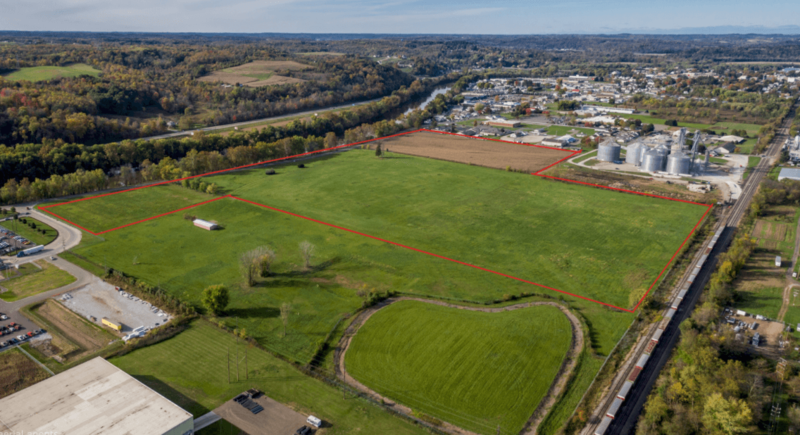 The topography of the Former GE Property is generally flat with a slight slope westward towards the Muskingum River. Average elevations across the site is 750 feet above sea level. According to the USDA NRCS, there is only one soil type listed for the Property. The soil type mapped is Tioga-Urban land complex (To) with 100% of the mapped area. According to the FEMA FIRM 39031C0215C, the site is located within two Flood Zones, AE and Zone X. Zone AE, located along the western property boundary is a special flood hazard area subject to inundation by the 1% annual flood chance, also known as the 100 year flood. Base flood elevations have been determined within Zone AE. Zone X occupies the remainder of the property and is listed as an area of 0.2% annual chance of flood; areas with 1% annual chance of flood with average depths of less than 1 foot or with drainage areas less than 1 square mile; and areas protected by levees from the 1% annual chance of flood. The USFWS NWI map for the Former GE Property, show no wetlands on the site. 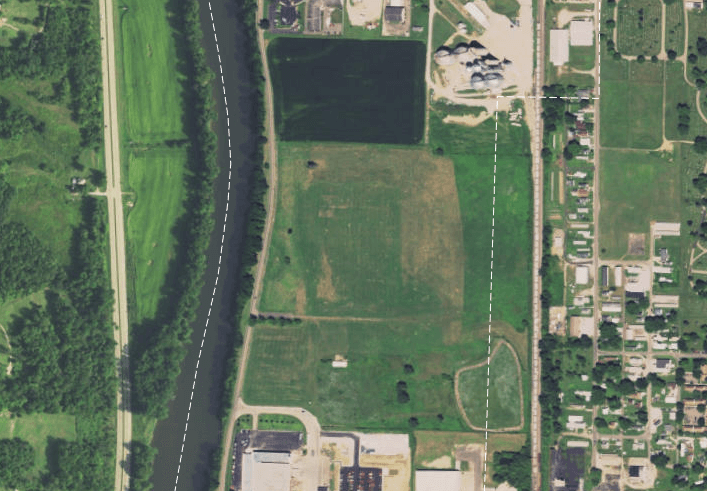 The primary vehicular access to the site is from S. 2nd Street to the west of the property and can be easily accessed from south of downtown Coshocton. S. 2nd Street is a two-lane road and there is good visibility for motorists turning into the site or out onto S. 2nd Street. This site is located 2 miles from US 36 and 15 miles from Interstate 77. A Central Ohio Rail line is located along the site’s eastern property boundary. Rail access is available for development. Central Ohio Rail is part of the Genesee & Wyoming Inc. system. The Richard Downing is located just 3 miles north of the site off Airport Road and US Route 36. The John Glenn International Airport is located on the northeast side of Columbus, Ohio approximately 72 miles west of the site. Gas service is provided by Columbia Gas and extends north and south along the railway east of the property. Currently gas service is available for the site. AEP Ohio service runs north and south along S. 2nd Street, just west of the property. Electric service is available for the site. The City of Coshocton provides water to the property. High use water service is available as the City water plant is rated at 15 million gallons per day with plenty of excess capacity. Water is available to the site and runs north and south along S. 2nd Street, west of the property. The City of Coshocton provides sewer to the property. High volume of sewer and waste water is available as the City wastewater plant is rated at 4.4 million gallons per day with plenty of excess capacity. Sewer is available to the site and runs north and south along S. 2nd Street, west of the property. Currently there are no storm drains or swales located on the property. Storm sewer service can be available as development of the property begins. Storm sewer drainage runs north and south of the property along S. 2nd Street. Telecommunication services is provided by AT&T and fiber optics/broadband is provided by Time Warner. Both services are available to the site. The lines for these services run north and south along S. 2nd Street, west of the property.